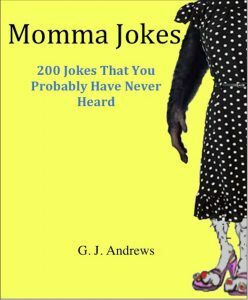 Author, G. J. Andrews has written a hilarious assortment of Momma Jokes. The jokes are original, clever and clean. Bedtime stories will never be the same! I have so many words and thoughts and I believe it is my destiny to share them with others. While my first release is far from ordinary it is an odd glimpse into the array of ideas and thoughts that will be revealed to the world. Brace yourself, but I promise you will be intrigued and compelled to see what comes next! Nonstop. Get it out! Keep your tools at arms length and don’t miss the opportunity to put the proverbial pen to paper. I write poetry and some of my best work has been created while on the stationary bike using my smartphone. Ha! SEAT-OF-MY-PANTS! I have used outlines when I have been at a loss for material. Doing so allows you to be creative in spurts, focusing on individual isolated aspects of your project. However I have more success starting with a blank slate. Outlines, for me, tend to create multiple future projects. I prefer the organic development of a single idea. Connecting the dots was never my favorite. The number one piece of advice I’d like to pass on: Write, just write…and do it for yourself. Critics, reviews… Do not be intimidated. Don’t fear them. Consider all of them to be your patrons. No matter if your critics are favorable or not so favorable, without you they are jobless. So bomb out, write a good stinker, just write. If you have something to say, don’t let anything stop you. I am a writer not a publisher. Just write and leave the publishing to the experts. Think of your goals. (I said your goals not your pipe dreams.) Again, consider your goals and choose a path that most compliments your objectives. There are as many publishing options as there are writers – No need to sell the farm. Just as it was in the past, so shall it be in the future. It is an industry. It will evolve, but at it’s crux the purpose will remain the same. It’s all about the books baby, all about the books.